Yeah so these pants. They really, really really weren't supposed to happen. So here's the story. A few weeks ago I was in my town centre and I saw a poster saying that Steps, iconic 90s awesome pop band Steps, would be turning on the Christmas lights in a few weeks time. I knew I absolutely had to be there but as time went on, I realised I hadn't clocked the date. So yesterday I was enjoying my last few days of unemployment (aka, spending the whole day browsing the internet) and it crossed my mind that I should probably check when the whole Steps thing was going on. And that was when I saw it, Wednesday 14th November. Crap! I knew I had absolutely nothing going on and I had no excuse to sit at home when I could be watching Steps, so I sent a few texts to see if anyone would accompany me (not gonna lie, I would have gone alone), as I expected, my best friend Eve was completely up for it, so we made plans to meet when she finished work. We went for a coffee but still had some time to kill, so we went to go see our friend Nic who works in Topman. Which naturally led to wandering into Topshop. Where I met these trousers. They were one of those things I prayed to the clothing gods to look bad on me. I prayed they wouldn't fit (does anyone else do this?!) because I knew I would end up buying them. But of course, I loved them. And I bought them. And a maroon polka dot pair too. Anyway, back to Steps. Stockport was crazy busy so we had to go up onto one of the carparks to see them, but they did do Deeper Shade of Blue and Tragedy, WITH DANCE ROUTINE. It was awesome. 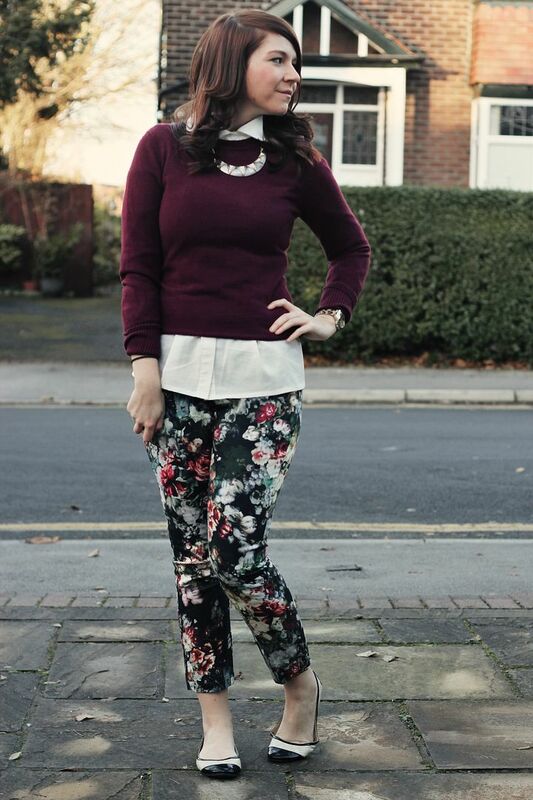 trousers- Topshop white shirt- c/o Oasap maroon jumper- Primark ballet flats- New Look necklace- Forever 21 Anyway, so the pants. I know I really shouldn't have bought them, but my justification is that for the right casual meeting at work I could dress them up with a smart blazer, white shirt and heels. I'm hoping to kind of sense the vibe with my workwear. 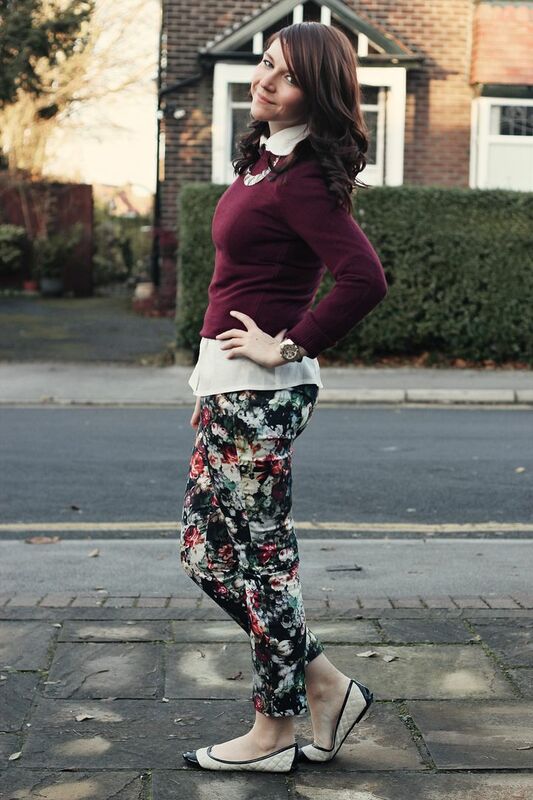 I obviously won't be rocking up in floral trousers on my first day. The nature of my job means my dresscode will always be changing. Because I'm working on the business side of a creative industry I have to be aware of the fact that while the designers and developers can wear jeans and trainers, I have to look smart. Plus I need to tailor my outfit to the clients I'm meeting. If the company I'm meeting are casual, then I should reflect that in my outfit, and vice versa with a more formal company. I did get all my working wardrobe organised today though which was really exciting. I found that only some of my clothes are business appropriate so I had to get a few things ready for next week. But I'm feeling pretty set now! As you can see, it's very bright, very fun, and well, still me. I didn't want my working wardrobe to be boring! Fortunately I already have lots of blazers, button-up shirts and pencil skirts so I didn't have many other things to get! I am going to try to post some of my work outfits, cause I know a few of you were asking me what I was going to wear for work. Like most graduates, I've never had to dress in a business casual manner before, so I'm hoping to pick it up as I go along and share that learning with you all along the way! I'll be back tomorrow with a Fitness Friday post. 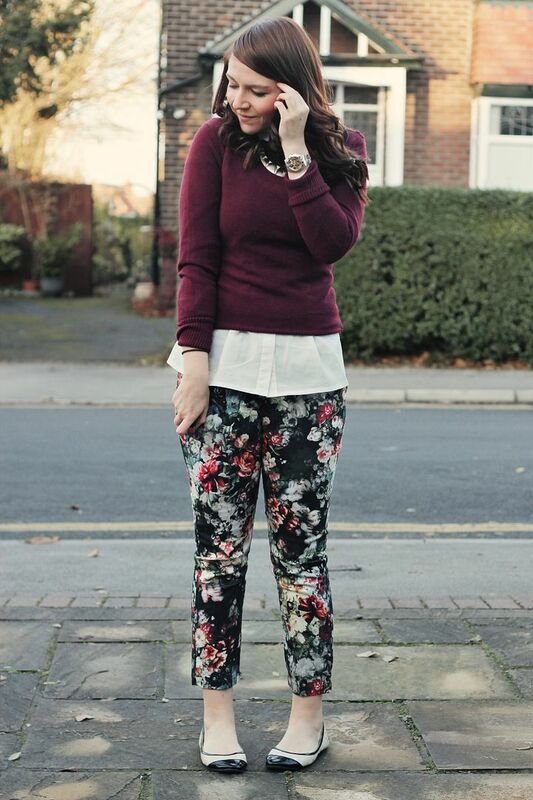 I know today was supposed to be a Foodie Thursday post, but a) I had to wear these trousers today and b) I decided while I still had the chance to post outfit posts I would do. Whee not long left now! Have a lovely day! I just discover your blog on Chictopia and I really love it! Awesome pants! I love those pants! 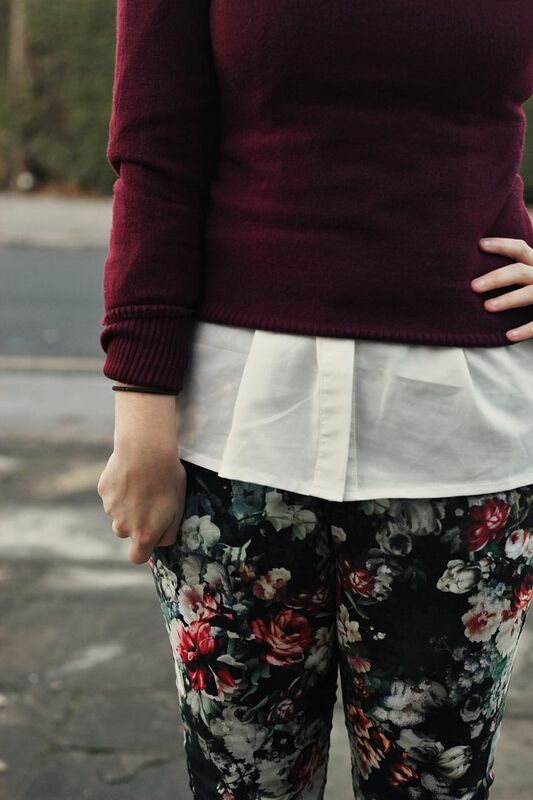 I don't have the courage to wear floral pants because I feel like they would accentuate my larger legs. I need to maybe consider this pattern then! I too have a pair which I love, and yes I wear them to work (but we have almost zero dress code). 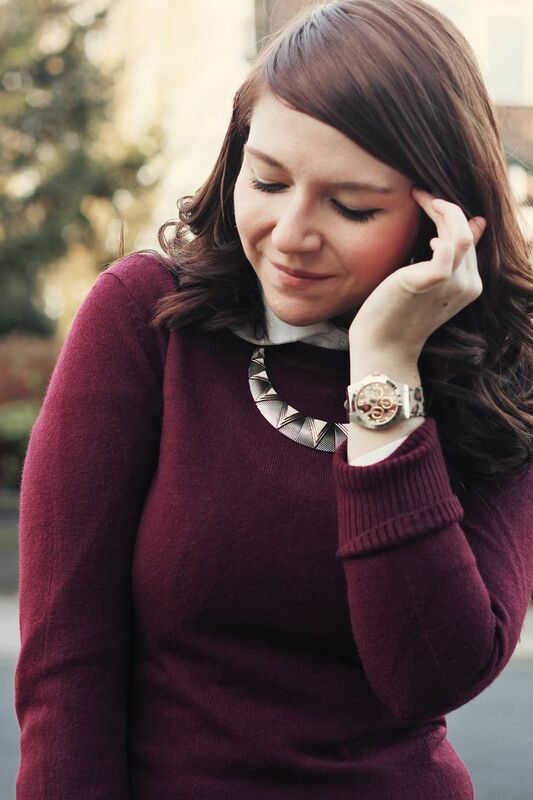 Love how you've layered yours, plus that's a gorgeous necklace! Yay for F21! If you check out my blog and like it, then please do follow... otherwise no worries! Love the pants! 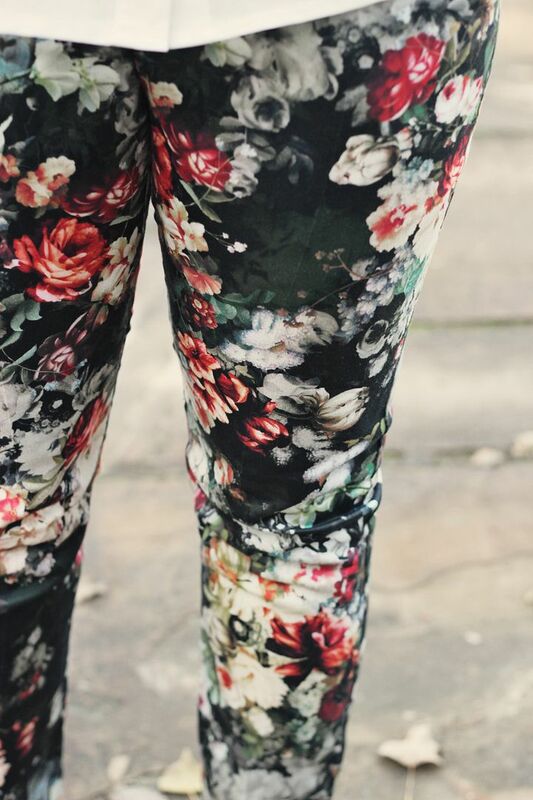 I'm a huge fan of printed pants in the winter... and these are just awesome!